Fill out our simple form and get quotes from local wedding caterers. It’s your big day, and each aspect of your wedding is important. 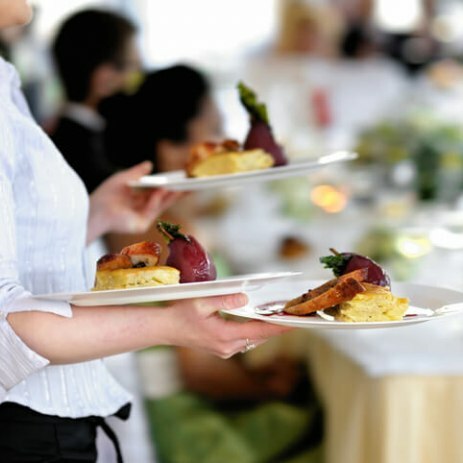 One of the big considerations is your wedding catering. There are more options than ever and plenty of opportunities to make your wedding food personal to you. We’re here to help make your decision and wedding catering planning a little easier. Do you need to hire any of the following items? How many children will be in attendance? Some wedding caterers will have a lower price for any children's meals. If there will be no children, please leave blank. Your wedding is unique and tailored especially for you, and this includes your wedding catering. Food and drink are a central focus at any wedding (second to the bride of course) and you want your guests to thoroughly enjoy the wedding food you provide, ensuring your tastes and personality are represented. Luckily, this is easier to achieve than ever with a huge range of wedding caterers across the UK offering wedding food catering in all forms and cuisines. Whether you’re looking for a formal wedding breakfast, a buffet, a drinks reception or just a snack we have a fantastic range of wedding caterers from the traditional to the quirky.